Chief Secretary Ramini Vos sat in silent contemplation before the communications panel. Thousands of lights and buttons sparkled before him as they tracked a complex flow of information; the conversations of a hundred people all tracked in a digital language he understood more intuitively than his native Vherokior. The Arek'Jaalan project had become a 24-hour operation in recent months. Initially, only a handful of capsuleers used the Eifyr & Co. networks that he oversaw, maybe a dozen in the first few weeks. Nowadays, the capsuleer channel hovered around fifty at all times, peaking to double that during the big meetings. Information requests from the public had increased even more aggressively, with Eifyr staff - lead in part by Vos - now handling upwards of 1,000 unique inquiries a day. The most common requests were for the basics; what the Arek'Jaalan project was about, and what its goals were. These were easily enough explained by the project mission statement, a document Vos had relied heavily upon as the requests began to pile up. 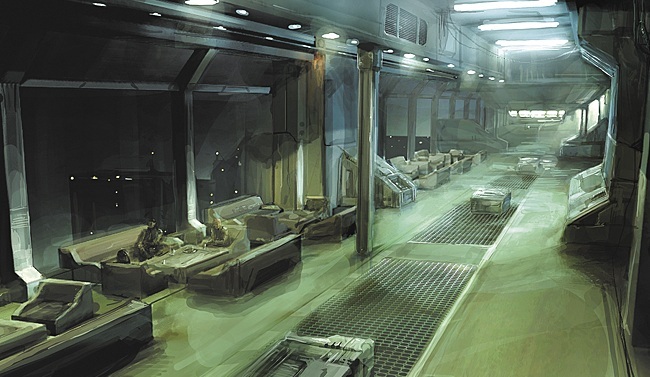 The Arek’Jaalan Project was founded to act as a cross-organizational research body and common ground for capsuleers to share information about the Sleeper civilization and related matters. Our goals are to research these matters, document our findings, and then educate the wider capsuleer populace on our work. Of course, while those few words were enough to sate the fleeting and shallow hunger of small time reporters (who comprised the vast majority of the requests Vos handled) they left out a few important details, to his mind. Unsavory things, perhaps, but as true as anything in the document he'd sent out over 800 times already this week. The whole "apolitical" approach was the most obvious omission, Vos mused. Arek'Jaalan had struggled to keep the politics out of the science so far. Most likely, the intent behind the mission statement was to help this flagging cause, by defining the project in purely scientific terms. Not a bad strategy, Vos reasoned, and yet one that left questions open about Arek'Jaalan's political stance. Answering them required a little more work on his part. Amongst his many responsibilities, the Chief Secretary had the unenviable job of being the primary contact for countless backwater planetary governments, both local and foreign. With little in the way of success, Vos would have to explain to Amarr officials how a capsuleer project backed by Minmatar Republic assets was "entirely apolitical in nature". In another meeting, often scheduled only hours apart, Vos would be assuring local Minmatar governors that despite Arek'Jaalan's refusal to make a political stand, no Republic interests (or citizens) would come to any harm through their work. After many long months of futile diplomacy, Vos had become increasingly bored with the politics of the empires and their unending feuds. The Chief Secretary was at hour fifteen of a day riddled with such meetings, and as his eyes began to close, and his mind began to drift, he would imagine that all these tiny points of light in the comms panel before him were actually stars in a universe that he alone was tasked to rule over. In these slow moments, he would drift away from Eram, and instead, oversee this universe from an uncomfortable metal chair, positioned near the one window looking out of his cramped and overheated office. On this evening, Vos was having a particularly vivid dream in which he, as master of the universe, was contending with a troublesome supernova that threatened to dwarf a little cluster of stars he’d grown quite fond of, having spent considerable time already optimizing their orbits. After many unsuccessful attempts at draining the nuclear fuel, he’d been toying with the idea of a well-placed black hole. The light from the dying star continued to grow, however, and as the tension of his fantasies began to mount, Vos (as he would so often do) retreated back the other way towards reality, just in time to notice a little supernova of his own. A rapidly growing light on the comms panel told him that someone was taking over an entire network hub, which meant either they were about to host a very large meeting, or wanted a whole section of the network to themselves. If that wasn’t enough to irk Vos, a man who had flown off the handle for much less, these same people were requesting the “immediate presence” of his superior, Hilen Tukoss, the leader of this little research movement Vos had become swept up in. The Chief Secretary took a moment to rub what he imagined was an exhausted expression from his face, and opened a private channel to the man in question. By the officially posted schedule, Tukoss had only been asleep for around three hours. This was easily the worst part of the job. Tukoss answered the call promptly – perhaps instinctively, Vos suspected, as the good leader’s head was inclined horizontally across what looked like some very comfortable pillows, and his eyes were firmly shut. Vos hesitated. “Are you with us, Tukoss?” he offered, after careful consideration. “What could you possibly want?” came a voice from the other side. Tukoss seemed to be sinking deeper into the pillows with every breath. “Someone’s taken the main comms hub all to themselves. Obviously it’s one of those people you gave a clearance key to,” Vos started, expertly (in his mind) laying the blame for this disruption at Tukoss’s feet. Against his better judgment, Vos continued. Taking a moment to gather his thoughts on some new communications protocols, Vos came to realize that Tukoss was now staring at him with a haggard gaze that said “not now.” Putting aside ideas about meeting request forms, he instead set his mind to wondering how long Tukoss had been staring. Vos nodded a silent reply. Tukoss sprang upright in his bed and leaned into the screen. Vos stifled a sigh, and with much greater effort, thoughts of all-consuming black holes.